The Amador County Water Agency (AWA) provides water, wastewater and storm drain services to Amador County. Serving approximately 10,000 customers in Amador County today, the Agency is the primary provider of drinking water. In addition the Agency manages and service’s over 1205 fire hydrants through out the cities of Ione, Jackson, Plymouth, Sutter Creek, Amador City and several special districts. B. As specified in the State Fire Marshal’s Guidelines for Fire Hydrant Markings Along State Highways and Freeways, May 1988 (California Department of Transportation, Traffic Manual, Chapter 6-03.4 “Location Markers–Fire Hydrants”). (Ord. 1734 §2(part), 2014). Office Hours Mon – Fri. 8:00 a.m. to 5:00 p.m.
Amador Fire Protection District, Sutter Creek Fire Protection District and other county fire crews are testing the AWA-owned hydrants, opening and closing the valves, checking the water pressure, and making sure that firefighters can access each hydrant in the event of a fire. 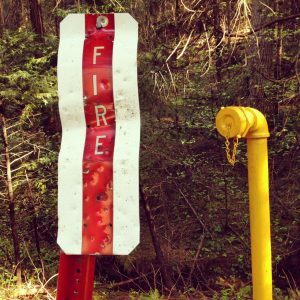 Brush, dirt or rocks occasionally must be cleared away from hydrants on Amador County’s back roads so fire personnel can quickly get their wrenches on the equipment. AWA next goal is to get every AWA fire hydrant painted yellow for visibility and consistency throughout the county. Community volunteers including homeowners and road associations, and the Amador City maintenance department have begun painting hydrants in their areas. AWA provides paint and brushes. Anyone interested in helping out in their neighborhood should call AWA Clerk of the Board Cris Thompson at 257-5238. You will need to come in or call the office for authorization and fee payment to pull water from a metered hydrant. Unauthorized use of a fire hydrant is illegal and considered water theft and is a misdemeanor under state law for which the offender may be prosecuted under California Penal Code Section 625. If you see someone drawing water from a hydrant, please notify the office immediately.